Illinois and North Carolina recently joined 23 other states in enacting renewable energy standard (RES) policies. Delaware also doubled it's existing standard last month while Missouri adopted a non-binding renewable energy goal. 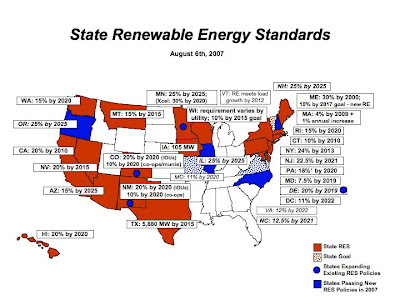 25 states now have RES policies with four states enacting new standards in 2007 and two others adding new renewable energy goals (see map below), making 2007 a big year for RES policies. The Illinois General Assembly on July 26 passed energy legislation that includes a renewable energy standard (RES) of 10% by 2015 and 25% by 2025, according to the American Wind Energy Association's newsletter, WindEnergyWeekly (subscription req.). The bill passed the House 80-33 and the Senate 40-13 and Governor Rod Blagojevich (D) is expected to sign it soon. Although the Illinois RES applies to all utilities, the state has a competitive electricity sector and about half of the state's electricity customers are supplied by “alternative retail electricity suppliers” (ARES), which are not yet covered by the RES. At least 75% of the standard must be met with wind resources and eligible resources must come from within Illinois initially and may come from Illinois or neighboring states after 2011. With the Illinois energy market the fifth largest in the country, it is estimated that the RES will require more than 4,000 MW of new renewable energy to be delivered to bundled customers, WindEnergyWeekly reports. The new standards is also expected to spur renewable energy development for competitive market customers as well. The North Carolina Senate on August 2 voted 47-1 for final passage of Senate Bill 3, WindEnergyWeekly reports. The bill includes a renewable electricity standard (RES) of 12.5% by 2021 with energy efficiency eligible to meet up to 40% standard being met with efficiency. While the North Carolina standard is not as aggressive as standards recently adopted by other states, North Carolina is the first southeast state to adopt a renewable energy standard policy, setting an important precedent within the region. "This [RES] sets an example for other states in the region to follow,” said Jane Preyer, director of the North Carolina regional office of Environmental Defense. “Despite its merits, the legislation has shortcomings, and the job is not over." Environmental Defense noted that SB 3 will reduce the state's carbon dioxide footprint by at least 13 million metric tons by 2018, which is equivalent to taking more than a million cars off the road, it said. In addition to the RPS, the legislation calls for simplified net metering and interconnection rules to remove regulatory barriers for new renewable energy generation and extended state tax credits for investments in renewable energy technologies to nonprofit entities such as churches. The legislation next goes to the desk of Governor Mike Easley (D) for his signature. Delaware Governor Ruth Ann Minner (D) on July 24 signed a bill that doubles the state's renewable energy requirement from 10% to 20% by 2019, according to AWEA. Under Senate Bill 19, the required level starts at 2% renewables in 2007, increasing every year by between 1% and 2% until it reaches 20% in 2019. The bill also specifies a minimum percentage of solar power needed to meet the overall standard. The solar requirement starts at 0.03% of each utility's electricity sales in 2009 and increases to 2% of sales by 2019. The requirement is structured to encourage the utilities to buy renewable energy credits (RECs) from Delaware homeowners and businesses that install solar power systems. A related bill, Senate Bill 8, specifies that utility customers retain ownership of the RECs associated with their net-metered renewable energy systems, so utilities must buy the RECs from the customers. It also allows utilities to stop offering net metering when the total customer-owned capacity equals 1% of the utility's peak load.The governor also signed Senate Bill 35, which doubles the funding for the state's Green Energy Fund. The fund helps to stimulate the local renewable energy sector by providing grants for renewable energy installations, technology demonstrations, and research and development projects. Missouri Governor Matt Blunt signed legislation to increase the use of renewable energy from sources such as wind, hydroelectricity, solar power, hydrogen, and biomass on July 10th, RenewableEnergyAccess.com reports. Senate Bill 54 creates renewable energy targets for utilities of 4% by 2012, 8% by 2015 and 11% by 2020. Utilities are expected to make "good-faith" efforts to reach these targets and are expected to report on their progress to the state utility commission. The bill directs the utility commission to give utilities multiple credits towards the goal for renewable energy generation within the state. The legislation also requires the Office of Administration to ensure that at least 70% of the new vehicles purchased for the state fleet are flex fuel and allows municipal landfills to accept yard waste in order to create bioreactors to produce methane gas. Additionally, SB 54 enacts net metering and interconnection standards allowing utility customers to install net-metered on-site renewable energy systems up to 100 kW in size. "This legislation furthers my commitment to Missouri's Green Power Initiative by increasing energy production in our state while practicing responsible environmental stewardship by increasing the use of renewable energy," Gov. Blunt said. North Carolina marks the 25th state in the nation to enact a renewable energy standard policy, meaning half of all states and well-over half of the United States population is covered by a state renewable energy standard. In addition to the 25 states with RES policies, Vermont, Virginia and Missouri have non-binding renewable energy goals on the books (see map above). New Hampshire, Oregon, Illinois and North Carolina all passed new RES policies in 2007, while Colorado, New Mexico, Minnesota and Delaware all expanded existing RES policies, doubling them or more. A bill that would have established a 10% by 2025 RES policy also passed the Indiana House of Representatives 77-20 in April, but the bill failed to pass the state Senate [as far as I can tell, anyway]. While stopping short of adopting a percentage target or goal, Arkansas also adopted legislative language this year that requires utilities to “consider clean energy and the use of renewable resources” as part of their resource plans. The legislation also gives the state PSC the option to allow cost recovery on clean energy if it is determined to be in the public interest. This language is similar to the language found in renewable energy goals adopted this year in Virginia and Missouri. Finally, Congress may very well send a federal renewable energy standard to the President's desk this year. The House of Representatives passed a 15% by 2020 federal RES policy along with a package of clean energy bills on Saturday, August 4th, the first time the House has ever passed an RES policy.